We’d love your help. 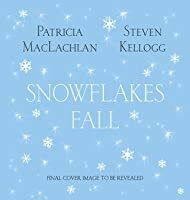 Let us know what’s wrong with this preview of Snowflakes Fall by Patricia MacLachlan. 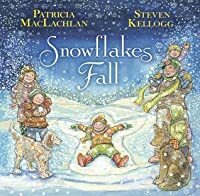 MacLachlan and Kellogg, who are longtime frie In Snowflakes Fall, Newbery Medalist Patricia MacLachlan and award-winning artist Steven Kellogg portray life’s natural cycle: its beauty, its joy, and its sorrow. Together, the words and pictures offer the promise of renewal that can be found in our lives—snowflakes fall, and return again as raindrops so that flowers can grow. To ask other readers questions about Snowflakes Fall, please sign up. A circular sticker with the above quote graces the cover of Snowflakes Fall. The sticker placed by Random House also notes that a donation has been made to The Sandy Hook School Support Fund. If these two sentiments alone are not enough to encourage you to buy this book for a baby or little friend, just open it and let the pages take you on a journey. The illustrations are breathtakingly beautiful and the writing simple yet meaningful. In the dedication, each author explains why they contributed to this book. Steven Kellogg hopes to capture the warmth he feels for the Sandy Hook community, which he describes as "an idyllic environment for raising a family". His wish to celebrate laughter and the uniqueness of children comes through loud and clear. Patricia MacLachlan sees the writing as comforting "with the idea of renewal and memory". As is true with many picture books a young child might not get the underlying message of loss or healing as it applies to the Sandy Hook Community but will delight in the pictures, the words, and the soothing tone of a parent reading the text. Add in the backstory regarding Sandy Hook, and it's so much more. This book...oh this book...What can I say that would ever be worthy of it? The first time I read it, tears were streaming down my face before I reached the end of the first line. Every time I open it up and read it again, the same thing happens. Patricia MacLachlan has been capable of brilliance and has written brilliantly for her entire career, but many decades after the publication of her first story, I believe Snowflakes Fall may be her magnum opus. I was stunned anew with each turn of the p This book...oh this book...What can I say that would ever be worthy of it? The first time I read it, tears were streaming down my face before I reached the end of the first line. Every time I open it up and read it again, the same thing happens. Patricia MacLachlan has been capable of brilliance and has written brilliantly for her entire career, but many decades after the publication of her first story, I believe Snowflakes Fall may be her magnum opus. I was stunned anew with each turn of the page by the enormous emotional power of this book, more powerful than all but a handful of books I have read in my whole life. When I found out the origins of Snowflakes Fall several months before reading it, that the story was created in memory of the kids slain in the tragic 2012 school shooting in Newtown, Connecticut, I suspected it might be an emotional read, but nothing like this. I'm looking through the book again at this very moment to remind myself of things I need to say about it, and I...I just don't know if I can do this. It's making me cry again right now as hard as the first time I read it. I can hardly see the words on the pages through the tears. I was and continue to be totally floored by this book. Snowflakes. "No two the same—all beautiful." Snowflakes drift softly from the whitened winter sky, a delicate gift landing on the nose or head of someone playing happily in the snowy drifts. There are so many snowflakes in our world, it can be easy to forget how intricate they are in their design, how unlike any snowflake that ever graced our good earth before. Two snowflakes may occasionally look alike, molecularly speaking, but no two are ever exactly the same piece of snow as fell before. They are lovely and radiant, even if one hasn't the time to put them under a microscope and enjoy every fine detail of their structure. They are beautiful just because they exist, for however long they bless our lives with their temporary presence. But even when the snowflakes melt, their wondrous intricacies draining away into the warm earth that welcomes them into its embrace, they never are truly gone. They gush and flow as water in lakes and rivers, brooks and streams. They continue to fill our lives with joy and remembrance, just in a different way than when they were snowflakes. They drizzle as quenching rain upon our hillsides and gardens, hydrating flowers and trees to grow tall and green in the spring and summer. They never leave us entirely. And when winter comes again, the promise of new snowflakes returns, softly gliding to land gently upon noses and heads lifted eagerly toward the sky, having waiting so long for this moment to arrive. The snowflakes are never truly gone as long as memories of past winters still warm our hearts, and new seasons of snowflakes falling wait to tickle our noses the next time they come around. I'll go ahead and say Snowflakes Fall is the most powerful picture book I've ever read. It isn't easy to surpass William Steig's Sylvester and the Magic Pebble or Tomie dePaola's Nana Upstairs and Nana Downstairs and Now One Foot, Now the Other in this regard, but Snowflakes Fall has done it. This book is clearly worthy of five stars, of that I have no doubt. Patricia MacLachlan's metaphoric images of sadness and loss are haunting and unforgettable, some of the most quietly potent I have ever encountered in any book, and her movingly tender reminders of the renewal that is bound to come our way even after all seems forever lost is...it's so beyond anything I've ever experienced, I hardly know how to put it into meaningful words. But Snowflakes Fall is a story brief enough that I don't need to explain further why it means so much to me. You'll know once you read it for yourself. And if ever you find yourself forgetting the truth of renewal of that which is most precious and unique in our lives, pick up the book again to help jog your memory. Just be prepared to sob as uncontrollably as the first time you ever read it, for Snowflakes Fall never loses its power to move a heart intimately acquainted with loss. There may never be a book more emotionally meaningful than this one. On places where the snowflakes had been. Such a beautiful, moving story filled with images and metaphors that will melt your heart. Snowflakes Fall is beautifully written and full of meaning. The illustrations are gorgeous and magical. This wonder of a book was created as a tribute to the victims of the shooting in Newtown, Connecticut that left 20 children, six adults and the gunman dead. The story celebrates the beauty of Winter, the uniqueness of each snowflake and each child, and the amazing circle of life. It's sad and emotional r Such a beautiful, moving story filled with images and metaphors that will melt your heart. Snowflakes Fall is beautifully written and full of meaning. The illustrations are gorgeous and magical. This wonder of a book was created as a tribute to the victims of the shooting in Newtown, Connecticut that left 20 children, six adults and the gunman dead. The story celebrates the beauty of Winter, the uniqueness of each snowflake and each child, and the amazing circle of life. It's sad and emotional read, but it's also magical in that it leaves you with hope and warmth in your heart. Such harrowing and powerful writing in a childrens book! I'll be honest and admit that out of all the childrens books I own, Snowflakes Fall is the one I cherish the most. Your children won't know the story behind this book (unless, of course, you'll decide to tell them), nor will they fully grasp it's profound message, but I'm 100% sure they'll sense just how extremely special and precious this story is nevertheless. You just can't miss that. This book was one answer to the terrible losses at Sandy Hook a few days over a year ago, and Random House is donating a portion of each sale to the Sandy Hook Support Fund. Because I know this, my perception of the book is changed, yet children reading it will delight in the beautiful snow pictures and the fun all the children are having. I was anxious for this title to get out of processing at our library. The wait was certainly worthwhile - I just finished reading this to my little girl; I cried. Naomi loved hearing the story. Snowflakes Fall is beautifully rendered by the very talented Patricia MacLachlan and Steven Kellogg. The illustrations are filled with wonder and whimsy - one is transported into the snowy landscape with great joy! MacLachlan's prose is spot-on, not smarmy or overly sentimental. I believe with several mor I was anxious for this title to get out of processing at our library. The wait was certainly worthwhile - I just finished reading this to my little girl; I cried. Naomi loved hearing the story. I think that the illustrations would have been great on their own. The words left so much to be desired!! I was sorely disappointed, because I love Patricia MacLachlan's work, and I've been fortunate enough to meet her on several occasions. I was even more excited that this book's profits go to Sandy Hook. I just don't know how much I'd love reading this aloud to kids. I'll give it a go with the kindergarten next month and we'll see if I change my tune. Until then, it's a 3. The events of Sandy Hook in December of 2012 still affect me deeply two years later. This book by Patricia MacLachlan and Steven Kellogg is a bittersweet tribute to the fallen children and teachers of that day. It is easy enough to read the book without referring to the reason it was written, and can be a good read-aloud for discussion with students to see what connections they make. You can't go wrong with Steven Kellogg and Patricia MacLachlan. The illustrations, message, and dedication are beautiful, moving, and inspiring. When people create art to help themselves cope with a tragedy and share it with everyone, it touches the world and helps everyone else too. Preschool-Grade 2. This peaceful offering begins on the endpapers with a happy scene of children peeking-out amid flowers and trees. As the eye pans across the spread, the seasons change—autumn leaves, then snowflakes, float down. The book begins its powerful meditation on the cycle of life. Readers will savor the beautifully paced descriptions as well as the delightful panoramas of children playing in the snow. Together, the poem and evocative watercolors tug at deeper emotions. Even as MacLachlan describes the flakes—Each one a pattern / All its own— / No two the same— / All beautiful—readers intuit she is also celebrating the children. In the extended metaphor, icy flakes strike the window pane in the dark, causing fright, but the morning promises to be brilliant. When rain, as it must in nature, washes the snow away, it helps summer flowers grow. Youngsters are left with joyful memories of snow angels and winter fun. This is a graceful homage to the inevitable seasons of life and remembrances of loved ones and times past. Whether or not they are familiar with loss and grief, children will feel the healing power of this hopeful, uplifiting book. HIGH-DEMAND BACKSTORY: These stellar talents were moved to create this book by the events in Connecticut and have dedicated it to the communities in Newtown. MacLachlan lets fly a string of moments and metaphors about snow, rain, and renewal. It's lovely if meandering, and the text is arranged imaginatively within Kellogg's dancing paintings of frolicking children and skies of snow. A note explains that the impulse for the book came from a desire to commemorate the children lost in the Newtown, Connecticut, school shooting, but the connection is tenuous. In tribute to the lives lost in the 2012 shooting at Sandy Hook Elementary School, acclaimed author and artist MacLachlan and Kellogg collaborate on a book that celebrates "the laughter, the playful high spirits, and the uniqueness of the children of Sandy Hook and of children everywhere," as Kellogg explains in his dedication. The text unfolds as a continuous verse, emphasizing renewal while drawing a comparison between the singularity of a snowflake and that of a child: "After the flowers are gone/ Snowflakes fall./ Flake/ After flake/ After flake/ Each one a pattern/ All its own-/ No two the same-/ All beautiful." Rosy-cheeked children and rowdy pet dogs cavort through the snowy wonderland of Kellogg's paintings, which give way to rainy spring scenes "Where soon/ Flowers will grow/ Again." The most direct allusion to the tragedy comes in two scenes picturing "fields of snow angels," a somber metaphor for the children killed. It's a potent reminder of the ephemeral nature of childhood and of the joys contained within those fleeting years. Ages 3-7. Agent: Rubin Pfeffer, East West Literary Agency. (Oct.) (c) Copyright PWxyz, LLC. All rights reserved. PreS-Gr 3-A gentle picture book created as tribute to the victims of the 2012 shooting in Newtown, Connecticut. In his dedication, Kellogg expresses his hope that this book "celebrates the laughter, the playful high spirits, and the uniqueness of the children of Sandy Hook and of children everywhere." And indeed, the image of falling snowflakes-"Flake/After flake/After flake/Each one a pattern/All its own-/No two the same-/All beautiful"-makes an affecting metaphor. MacLachlan's lyrical and understated poem describes snowflakes swirling "together/Like the voices of children" to blanket backyards and sleeping gardens, rolling countryside, and the town's familiar sites. Though a nighttime storm may bring shadows that "darken dreams," morning always comes again, revealing a shining world and the opportunity to play outdoors. In springtime, "when the flowers bloom/The children remember the snowflakes/And we remember the children-/No two the same-/All beautiful." Throughout, Kellogg's paintings dazzle with brightly clad kids joyfully romping through winter scenes. As flowers bloom, some of the youngsters dance into a still-snowy sky, and the back endpaper shows a row of 20 snow angels taking flight from a moonlit hillside and soaring into the heavens. Accentuating the rebirth found in nature's cycle, text and images depict the process of healing and renewal, the comfort of memory, and the power of hope. Adults can share this book to address tragic events, discuss grief and the recovery process, and remind children of the precious beauty of life.-Joy Fleishhacker, School Library Journal (c) Copyright 2013. Library Journals LLC, a wholly owned subsidiary of Media Source, Inc. No redistribution permitted. I was a bit disappointed with Patricia MacLachlan's children's book, "Snowflakes Fall". She is an award winning author but this seems like standard type fare. Children are compared to snowflakes being unique beings that they are. The language is pretty flowery. The artwork seems overly sentimental. As a society, we have turned snowflakes into a derogatory term so it is likely I'm influenced by that. Excellent illustrations. We, in 2nd grade, are actually going to be using this book as one of our picture walk books to discuss the changing season, and the needs of living things to prepare for this change. In addition to the beautiful illustrations, the words are descriptive and placed on the page so purposefully. This book had nice words, but no rhyme. This book had nice pictures, and some mystery. A bobcat, referred to on one spread of pages, appears on the next one. The conclusion, that snow becomes rain, and winter weather becomes blooming spring is a bit much. The idea of no two snowflakes alike, and no two children alike was plenty for a great book. If you don't read the author's notes, you might never know this was written for and about the Sandy Hook shooting. But if you do, it turns what could be a sweet seasons change book into a bit of a sob fest. I discovered this book after I worked on a production of playwright Eric Ulloa's "26 Pebbles" with a group of college students. I asked about the designer's choice of snowflakes, and she explained the significance to the Sandy Hook massacre. What a lovely little story about the cycle of life. When it comes to children's books, the bar is not high for gramnar and widow/orphan control but this book doesn't clear that bar. The book is prose, which is fine, but the cadence of phrases from page to page feels really clunky. This was a cute book and fit I children I would read this book two them. Beautiful illustrations by Steven Kellogg. MacLachlan covers a lot in this poetic book. She even throws in some science. This story shows the delight of children over the changing seasons, the hope and renewal after winter. Fun illustrations. The book is a tribute to individuality. A beautiful tribute to those who died in the Sandy Hook shooting. Also, a good way to teach children about life and death. This was just a slightly cute book about how no snowflakes are the same, just like children. And all special. It had a nice message and I found it touching, Steven's role and place in Sandy Hook, however I didn't see a way to use it for 3rd graders. Maybe as more of just an introduction, or fun winter read, but not what I was expecting for the educational purpose. This story is about how the world looks like after snowflakes fall and what happens when the snowflakes melt. It details all the different places where snowflakes fall. It falls on people, it falls on the trees, it falls on houses, churches and rivers. It makes the world look all white and clean. When snowflakes fall a lot, children can enjoy the snow from inside their warm houses. It also explains that no two snowflakes are the same and they are all different just like children all over the wor This story is about how the world looks like after snowflakes fall and what happens when the snowflakes melt. It details all the different places where snowflakes fall. It falls on people, it falls on the trees, it falls on houses, churches and rivers. It makes the world look all white and clean. When snowflakes fall a lot, children can enjoy the snow from inside their warm houses. It also explains that no two snowflakes are the same and they are all different just like children all over the world. They are all different and special. The Johnny Appleseed: A Tall Tale picture book I grew up with was Steven Kellogg and the first chapter books to memory were Patricia MacLachlan so I was intrigued to see these two team up in a new picture book for winter. Snowflakes Fall is beautiful. Perfect for a snowflake study as a poetic read aloud. Also wonderful as a read to express how precious the qualities of someone or something are invidividual and entire unique. The illustrations are enchanting with children and dogs definitely recognizable from Steven Kellogg. Pictures throughout are powerful fuel for the imagination on both dark and light tones. An enjoyment to read and view. What struck me first was the gorgeous contrast of white snowflakes on dark blue sky, accented by the bright winter clothing of the children and families in the illustrations. There is a theme of changing seasons giving us both flowers and snowflakes (with rain as a necessary transition). The other repeated theme speaks of both snowflakes and children: Each one a pattern all its own--no two the same--all beautiful. Each illustration merits study for its delightful details. There is so much joy he What struck me first was the gorgeous contrast of white snowflakes on dark blue sky, accented by the bright winter clothing of the children and families in the illustrations. There is a theme of changing seasons giving us both flowers and snowflakes (with rain as a necessary transition). The other repeated theme speaks of both snowflakes and children: Each one a pattern all its own--no two the same--all beautiful. Each illustration merits study for its delightful details. There is so much joy here in both the text and the illustrations. Also a little fear in the wailing winds of a storm, flying branches, and shadows that darken dreams, but joy comes in the morning. It was only after I had read this beautiful book, grinning all the way through, that I discovered it had been written in remembrance of the children of Sandy Hook. Suddenly the endpapers with a child running off into snow on a summer day and snow angels flying off into the heavens took on new meaning. Twenty snow angels, twenty children. 3) This book is about snowflakes and where they fall and what you can do with snow. It talks about winter and the characteristics of winter. This book is very poetic in its wording and even the way the words are on the page. 5) This book can be used to talk about winter as a season. It describes how winter takes over from fall and different characteristics of winter. It can also be used to talk about how we are all different but still beautiful. One of the big points of the book is that snowflakes are all different and all beautiful. This is a great opportunity to compare that to people and then do an activity with drawing or cutting snowflakes to show that we are not beautiful in spite of our differences but because of them.